Some Essentials is providing Santa Clarita access to high-quality personal care products. Some Essentials uses all-natural and cruelty-free ingredients to leave your skin healthy and your mind at peace. Support Santa Clarita business and achieve healthier skin with Some Essentials. They offers a wide range of products from hard lotion bars, all-natural deodorant, skin creams, sunscreen, lip balms, soaps, and more. One of their signature products is the hard lotion bar. Resembling a bar of soap, the hard lotion bar uses your own body heat to heat the bar into a liquid lotion which can then be used to moisturize the skin. These bars come in various sizes, from large bars suitable to be used at home, to small bars that make for a convenient item to travel with. Deodorant is one of the signature products offered by Some Essentials. The deodorant is vegan friendly, and utilizes bentonite clay instead of irritating baking soda to draw out toxins, and uses essential oils such as tea tree and lavender oils to help keep you feeling fresh and clean. The classic deodorant ships in a jar, but there is also a twist-up option for added convenience and familiarity. The switch from a big-brand deodorant to an all-natural deodorant can have a detox period that can last a few days to a few weeks, but if you stick it out then you will be thankful how much better an all-natural product feels. Some Essentials believes in using the best ingredients, and publishes everything they put into their products. As with an personal product, different people react differently to different products. Some Essentials encourages customers to research and experiment their various products to find the right fit. 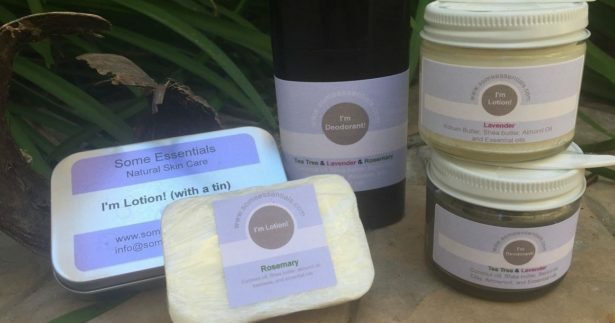 If you can think of a skin care product then Some Essentials probably has it. If you are in need of soap, sunscreen, or anything else then check out Some Essentials to see if they have what is right for you. Try out a sample pack to find out the best products for your own individual needs. There is free shipping on all orders within the United States, which of course includes Santa Clarita, and international shipping is offered based on weight. All shipments are sent through USPS First Class mail and takes 1-2 days to leave the Some Essentials warehouse.